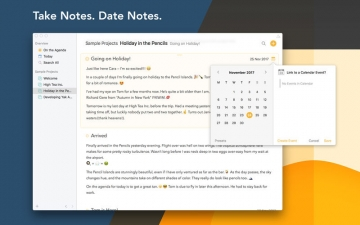 [無料] Agenda – A new take on notes | Mac App Storeのアプリ検索・ランキング BuzzMac! The notes in Agenda are beautifully styled, and include powerful features like tags, lists, and links. 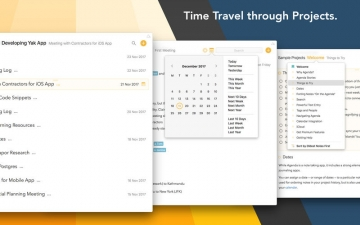 You can even connect your notes to events in your calendar. Notes that are On the Agenda are given special status. You can search for them more easily, and they get added to a special group in the sidebar so you can find them in a flash. Agenda keeps what is most relevant right in front of you. 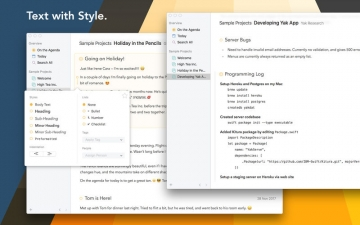 Agenda is a styled-text editor. Styled text combines the best of plain text and rich text. It is as easy to edit as plain text, but allows meaning to be added, leading to visually stunning documents without breaking a sweat. Best of all, your completed tasks don’t get sucked into the archive abyss when you are done with them, but are there for future reference and searching. A notes app is not very useful if you can't share what you create. 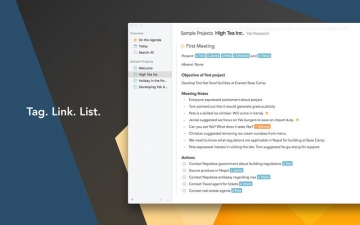 With Agenda, you can print and share notes, even whole projects, in standard formats like PDF, RTF and Markdown. You can also use the Agenda archive format to exchange exact duplicates of your notes with other Agenda users. 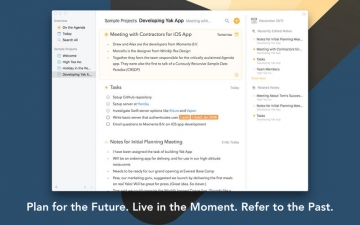 Agenda is integrated with iCloud, so your notes are kept in sync across each of your Macs. Agenda does offer extra premium features that require an In App Purchase. If you decide to purchase the upgrade, you permanently unlock all current features across all of your Macs.